Clyde Wisham, Alexandro P., rbfarmer, tomgrz and Jim Symon like this. 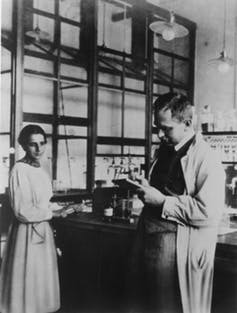 IMAGE :- Lise Meitner and Otto Hahn in Berlin, 1913. That's a fake story. For if she were obscure and largely forgotten, how come there are dozens of awards and honors in her name: https://en.wikipedia.org/wiki/Lise_Meitner#Awards_and_honours ? Hi Thea, It is a new site for me. Some of the info is wrong. Did she get a Nobel?. No, she didn't, because she didn't create anything experimentally. Nobel prizes are only awarded for actual instruments/experiments, but not for theoretical work. Not as far as I know. Do you have an example? There is no Nobel prize for mathematics. I didn't mean to say that no theoretical work gets a prize, but what I mean: A theory can only win an award if there is an experiment to validate the theory. And obviously the theory has to be made before the experiment. The Higgs Boson was a theoretical prediction by Peter Higgs in 1964. However, he only won the Nobel prize 60 years later, after an experiment at CERN validated its existence. Explaining something after an experiment is not worthy of a Nobel prize; Lise Meitner's own newphew said so. I hate to divert the conversation but Obama got the Peace Prize and it was based on a theory of what he might do. Am I wrong? I assumed we're talking about the real Nobel prizes. Everyone knows that the Nobel prizes for literature, economics and peace are worthless trophies given by political considerations. Sorry but I couldn't help myself. Hi Thea, Thanks for the correction. I will stop the newsletter from this site. I don't review everything i post, that is why it is good to have people like you around. I disagree with the HIGGS-BOSON research at CERN. The Large Hadron Collider ( LHC ), which cost over $20 BILLION , is another ( huge ) example of Scientific and Financal corruption, fraud etc.